Click on the pic to know more..
Amazing experience with this tea vendor, on our way from Kolkata to Sunderbans.. in West Bengal Countryside. 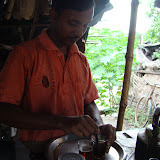 Best tea I have ever tasted.. amazing hospitality and at cost only Rs.1/- per glass of tea. Sept 2009.